What is an evacuation plan? An evacuation plan is an understandable representation of the structural situation which provides insight into the possible escape routes in the event of a calamity. Also, evacuation plans are provided with safety symbols which represent the location of, for example, fire fighting and rescue equipment. They are part of the information provided at onshore, maritime and offshore installations. ISO-23601 and ISO-17631 are the basis for our escape and evacuation plans. 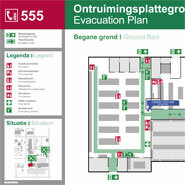 Blomsma Signs & Safety draws up escape and evacuation plans using simple stylistic visual imagery. This improves legibility (for people who are not used to reading technical drawings as well) and encourages unambiguous interpretation of information. It helps people get their bearings correctly and helps get relevant escape route information across. In accordance with escape route marking and corporate branding. 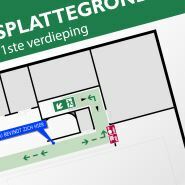 Recognizability and attention are increased by using primary colours in accordance with escape route marking. Drawing up the plans using the client’s corporate branding will create uniformity within the client’s organization. This is particularly useful if the employees work at varying locations, and gives a professional appearance without affecting the safety message. 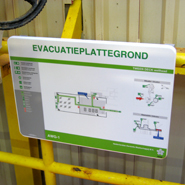 An evacuation plan sign is primarily designed for use in the event of an emergency. 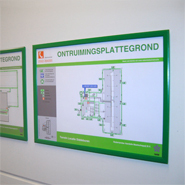 However, even when there is no emergency, escape and evacuation plan signs are useful as information that is provided to help people determine their location. This will give those interested information about their position within a building or on a site. At the same time, they find information about emergency exits and escape routes. Creating your own evacuation plan can be a challenging and time-consuming task. When creating evacuation plans for your company, we not only provide a good attention value, so that passers-by are encouraged to look at them, but we also ensure that the evacuation plans comply with the legal standards (ISO-23601). For more information or to request a quotation, please contact us.